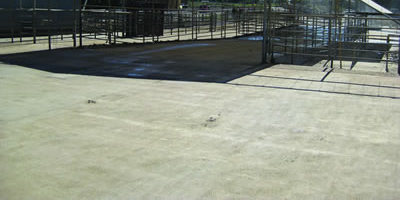 Remember, the type of surface can influence cow health – particularly mastitis and hoof health. Earthen surfaces need to be well compacted. Overtime, the surface will develop a compacted layer of manure and soil to form a biological seal – this decreases the infiltration of water. Sub-surface drainage using slotted drainage pipes 1.5-2.0 m apart should be overlaid by 20 cm gravel and can be topped with rice hulls or saw dust if desired. 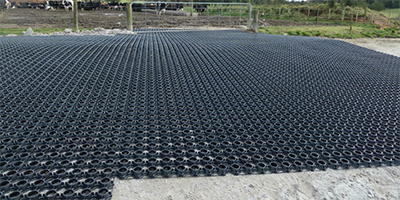 Geosynthetics are thin, flexible and permeable sheets of synthetic material used to stabilize soil. Cheap and resistant to moisture and bacteria, their filtration restricts movement of fine soil particles but allows some water to permeate. 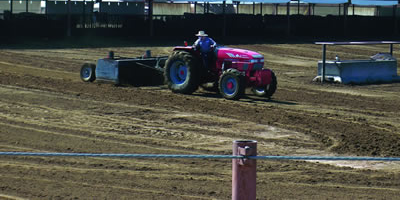 They also reinforce and stabilize soil to decrease compaction by stock. Concrete is hard wearing and with the correct slope, can control drainage well. It is the most expensive option for a feed pad surface. To avoid concrete becoming slippery, score or groove during construction. Strength and thickness recommendations depend on the strength of the sub-base and base materials plus cow numbers.